MTV Asia will premiere the ‘2019 One K Concert’ as the first cable broadcaster of the concert in Southeast Asia. To help as many fans as possible to get their dose of Kpop, Twitter will be MTV Asia’s exclusive social media partner to stream the concert to #KpopTwitter fans around the region. 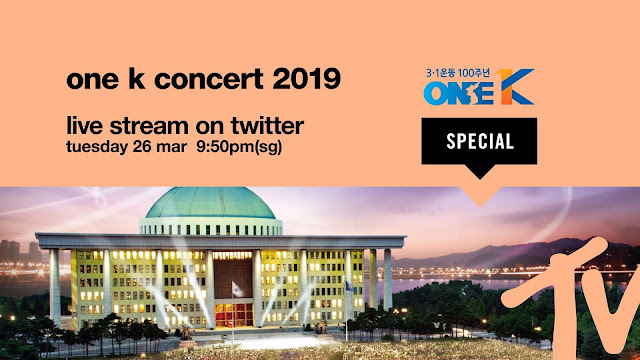 Over 20 Kpop stars lent their voices in this concert that signifies the message of ‘One Dream, One Korea, One World’, in commemoration of the 100th anniversary of a movement towards independence in South Korea. Hosted by boy band Astro’s Cha Eun Woo and girl group Gugudan’s Kim Se-Jeong, the star-studded lineup includes Ha Sung Woon, OH MY GIRL, MONSTA X, APRIL, ASTRO, SF9, (G)I-dle, LABOUM, SONAMOO, CLC, DREAMCATCHER, KARD, ONF, TRCNG, DUETTO, Kim Jo Han, Baek Ji-Young, Jung In, ALi, Cheetah, BEN, Seo JiAn, Gilgu Bonggu, and Juniel. *Catch the repeat linear telecast on 27 March at 8AM (Indonesia) | 9AM (Singapore) | 10am (Malaysia); and 28 March at 2PM (Indonesia), 3PM (Singapore) and 4PM (Malaysia).